A distinctive guitar that is full-to-the-brim with character. Style, build, sounds and vibe. Post-Brexit exchange rate makes what is an expensive guitar very expensive. 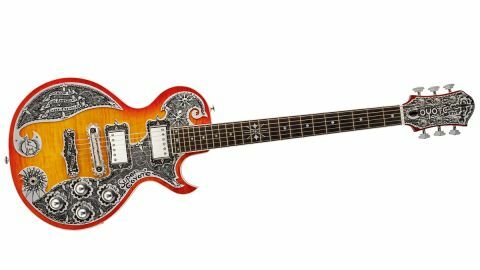 Teye Guitars is named after the brand's founder, Teije Wijnterp (aka Teye), whose claim to fame as a guitar player is his association with Joe Ely in the 90s. He started building guitars a decade ago and now aims to produce 150 guitars a year in the company's new Nashville-based facility, where it relocated to, from Austin, early in 2016. The Super Coyote is part of a limited run that begun in 2015 at the company's previous Austin base and, despite its price, comes from the start-up TMF (Teye Music Factory) level. The Artisan models, with hand-engraved plates, are the next 'level' up, topped by the very limited Master guitars, which are handmade and engraved by Teye himself. Zemaitis style abounds here: a similar headstock with its curved rear tip; the neck joint where the full width neck slots into the body like a bolt-on, but is glued, leaving a noticeable edge in the treble cutaway; the 24-fret single-cut style with its more waisted outline. quite low on the body, with an additional and sharply-pointed etched plate. Even the pickup rings are etched aluminium. a Zemaitis-like three-piece mahogany neck, two-piece mahogany body, thin 3.2mm centre-joined maple cap, and overall body depth of 40mm. Its specific visuals, not to mention its rock-ready voicing and that interesting Mojo circuit, all add up to one thing: character. While the top has a classic Cherry Sunburst and single white edge binding like the ebony fingerboard, flip the guitar over and it appears to be some kind of exotic wood. In fact, its 'Shipwreck' finish is an effect with very wood-like dark striping, for the most part, that's echoed around the sides. The actual low-sheen finish is classed as 'luthier's oil' and, again, matches the low-tech vibe of original Zemaitis guitars. to give it its full name. It's all very industrial, with domed aluminium knobs and a single rubber 'O' ring grip. Then we have a five-way lever pickup switch that expands the usual bridge, neck and both pickup selections with, in position two, bridge humbucker plus tapped neck pickup and, in position four, both humbuckers but out-of-phase. The Mojo is a passive circuit that gives surprising scope to this guitar's potential sounds. The tricks lie primarily in the master Mojo control (placed fully clockwise, you feel a little notch and it's effectively out of circuit). on and gradually moving the Mojo back on the neck pickup, it's quite subtle, thinning out and softening the upper mid peak, making the sound subtly less attacking. In conjunction with the five-way pickup selector, the dual volumes and the master tone, there are numerous textures and characters. It works especially well with different amp gains, not to mention sitting the Coyote with other guitars. Yes, you can evoke some more Fender-like voices, or lower output mini- humbucker voices, but you can do that on plenty of guitars. Of course, as with any tone modifier, you don't have to use it. The sounds here have plenty of classic mahogany grunt squarely anchored in punchy, power-amp-driven classic rock: think SG, Les Paul Deluxe and a slightly less wide, more focused Les Paul. The neck profile is a pretty full C, 21.8mm deep at the 1st fret, 23mm at the 12th. It feels very right for the style - certainly not a 'speed' neck - and its fairly wide, flatter compound radius 'board makes for a great player, with cleanly installed medium gauge frets that are not over-high. for the style, but it adds its own character in a firmer feel - and then there's the sound of both that and the ebony 'board, as opposed to the usual rosewood. Overall, it's on the heavier side, but, again, that might help its punchy, powerful delivery; it's not as airy, resonant or detailed sound-wise as a 2016 PRS McCarty, for example, but it has character in spades. Yet another example of the longevity and inspiration of Tony Zemaitis, this Teye Super Coyote actually feels more like the originals than the more 'production' feel of the guitars that still bear the Brit luthier's name. It not only recalls Zemaitis but also summons up a rather long-lost past when pro players would buy and play custom-made instruments, because the big brands of the day offered a small selection of often not-very-good instruments. Is the Super Coyote the 'best' guitar you can buy for the money? Probably not. But in today's ultra-crowded market, its specific visuals, not to mention its rock-ready voicing and that interesting Mojo circuit, all add up to one thing: character. Something that's lacking in the mainstream world.